Michael G. Wilson and Barbara Broccoli, co-bosses of Eon Productions, want to do a non-007 horror project. In fact, this project has kicked around for a few years and would be based on a story that generated a 1957 movie and multiple radio adaptations. Background: The official Web site of the Broadway musical Once, based on a 2006 movie,which picked up a number of Tony awards, had THIS REFERENCE about creative personnel responsible for the show. Wilson and Broccoli (not to mention Frederick Zollo, Broccoli’s husband) are among a group of producers for Once, the Broadway show. So this isn’t something that came from a U.K. tabloid newspaper. Anyway, Casting the Runes is a story by M.R. James (1862-1936), a writer of ghost stories. It was adapted in 1947, 1974 and 1981 for radio. 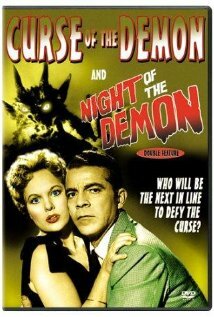 It also was the basis of a 1957 movie titled Night of the Demon in the U.K. and Curse of the Demon in the U.S. The movie starred Dana Andrews and involved a demonic cult. You can read a detailed summary BY CLICKING HERE. By coincidence, the crew includes two people who’d have an impact on 007: writer Charles Bennett (co-scripter of the 1954 CBS version of Casino Royale) and production designer Ken Adam, who’d design the sets of seven Bond films. After delivering their screenplay for Quantum of Solace, they wrote Barbarella for director Robert Rodriguez, to be produced in 2009 by Dino DeLaurentiis, and have adapted John Le Carre’s latest novel, The Mission Song, for producers Simon Channing-Williams and Gail Egan. Their most recent collaboration is with director John Carney, on an adaptation of an M.R. James horror story, Casting the Runes. Is Casting the Runes still an active project? Hard to say. Potential movies can kick around for years (just ask fans of The Man From U.N.C.L.E. who’ve waited for decades to see if a movie version would develop). But it would appear it’s still of interest to the co-chiefs of Eon.